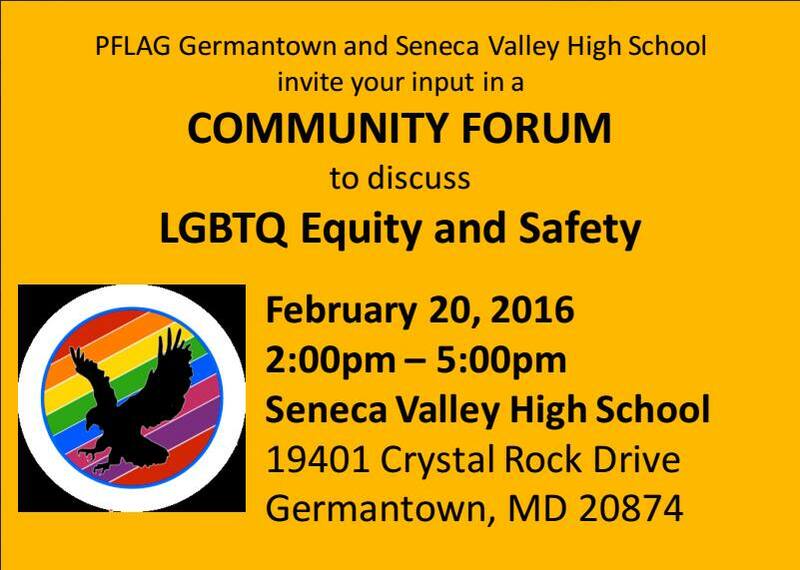 The event flyer -- this eagle is the symbol of Seneca Valley High. 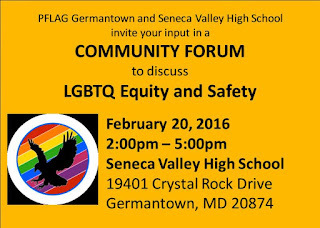 Today PFLAG Germantown (MD) -- a community group of Metro DC PFLAG – held the Germantown Community Forum on LGBTQ Equity and Safety with and at Seneca Valley High School (the public high school of Germantown; part of the Montgomery County MD public school system) from 2:00 to 5:00 p.m., and we attended. This event was partly in response to the October murder of Zella Ziona, a 21-year-old black transgender woman; Germantown was Zella’s hometown, she attended Seneca Valley High, and she was killed in Gaithersburg (my partner Julia’s hometown and our current home). And it made a good start at doing what it said on its tin. The panelists were my colleagues Michelle McLeod of Honorary Nieces and Nephews, Karen Holmes of Metro DC PFLAG, and Rev. Miller Hoffman of Open Door MCC; joined by Gerri Carpenter, parent of a transgender son and lesbian daughter. The moderator was John Bartkowiak of PFLAG Germantown. After the panel, we attendees each chose a small group discussion topic, and went to a classroom – Julia and I chose Faith & The LGBTQ Community, facilitated by Rev. Miller, with Rev. Anne Holmes of Seneca Valley UCC. There was also Institutionalized Homophobia with Michelle, Parents and Teens : How to Talk About Sexuality with Gerri as well as Jean Bertelmann of PFLAG Germantown, and Trans-Awareness with Karen and John, and Mental and Physical Health Concerns with Bianca Palmisano of Metro DC PFLAG, Policing with Sergeant Jessica Hawkins of the DC Metropolitan Police LGBT Liaison Unit and Officer Rose Borisow of the Montgomery County Police Department. After the small group discussions, we all came back together for discussion and questions and answers. The event was open to the public, and had meal-worthy food donated by Wegmans and &Pizza. Unfortunately there were very few attendees, especially outside of Seneca Valley High people, but that made some sense under the circumstances. And the event did display an unusual level of nuance and potential – for one thing, there was far more, and more diverse, trans content that one would expect. The cafeteria where most of the event took place was far too hot, but in fairness the weather today was very Springy instead of Wintry (and I have a cold). A more addressable concern is that the breakout rooms were set up mostly with those combination chair-and-desks that do not accommodate many fat and/or disabled people – this is an issue not only when hosting events, but for the school’s students and other usual users as well. More information can be had by contacting J.C. Fellows at Joanna.C.Fellows@mcpsmd.net. The hashtag is #NoH8Gtown.